We began our operations in 1995 with one service truck and two employees. Complete Pumpjack Services currently employs four service trucks, a highway tractor with trailer, a 33T crane truck with trailer, two shops and 14 employees (see our Services page for more detailed information). 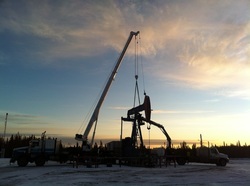 We have worked very hard to achieve steady growth over the years, and have earned an excellent reputation for quality workmanship and services throughout the Western Canadian oilfield industry.